After several days of glorious sunshine, the arrival of blizard like conditions came as quite a shock on this day, Thursday the 28th of April...in the Troutbeck Valley. The anxious ewe keeps a weather eye on her off-spring! 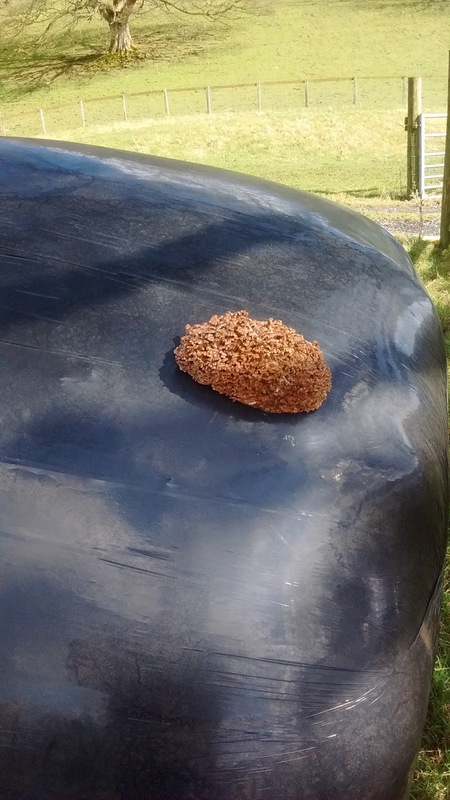 Just a tiny hole in the bale wrap has enabled the fungi within to fruit like this...anyone know what variety this one is!? 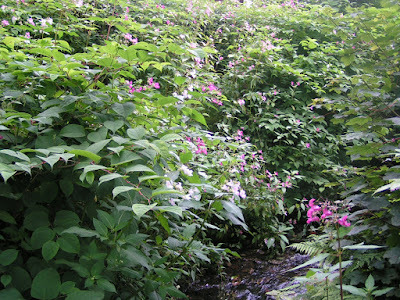 Spread of Invasive Himalayan Balsam after the Floods. An increase in the numbers of Himalayan Balsam seedlings are taking root at Millerground, on the east side of Windermere, this April. (See image below). 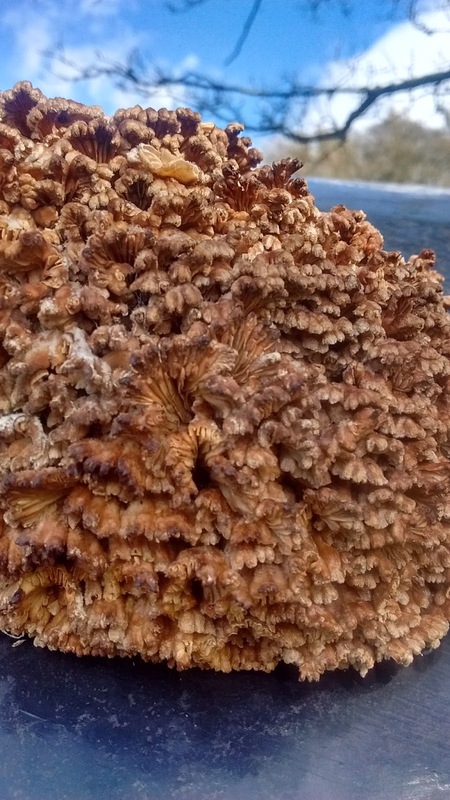 Flood water has dispersed seeds from upstream over a much larger area than usual and in much greater concentrations. 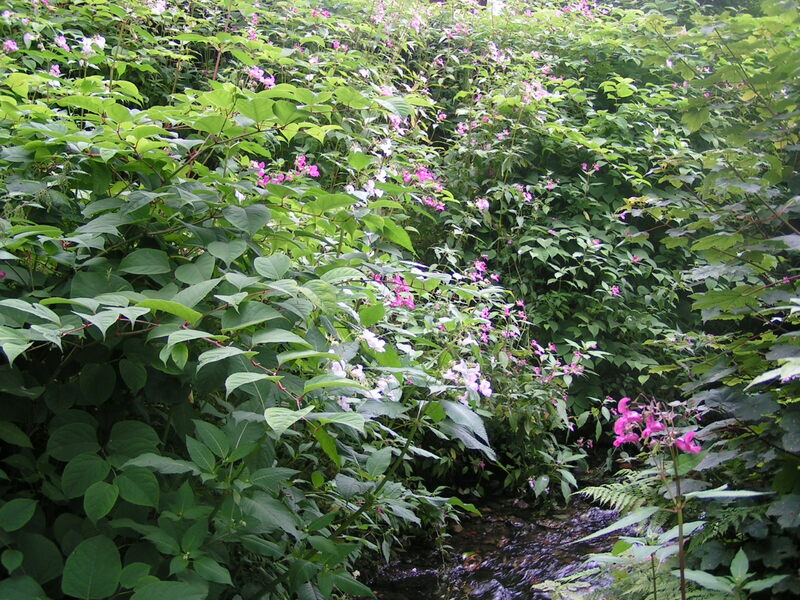 Himalayan Balsam is highly Invasive and will take over large areas if not controlled. 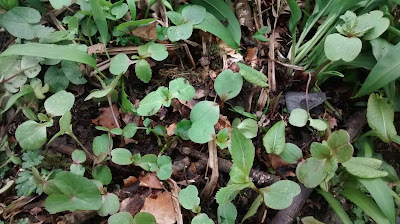 Millerground is an important site for the rare native Touch-Me-Not Balsam which, sadly, is easily out competed and ousted by alien plant species especially Himalayan Balsam. 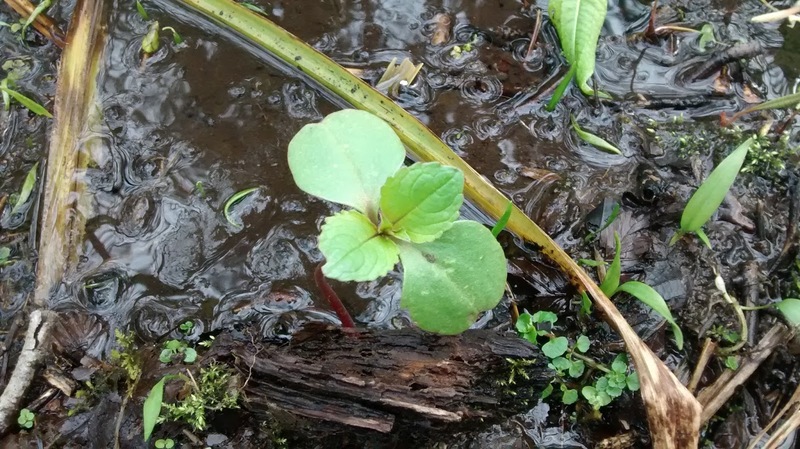 This is an image of a Himalayan Balsam seedling. 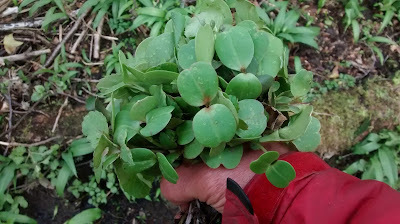 The heart shaped leaves running from top left to bottom right of the image are the cotyledon leaves which are present in the seed prior to germination. The first true leaves formed after germination are to be seen diagonally from top right to bottom left. ....to form dense stands like this one in following seasons. This stand was photographed in July on privately owned land above Millerground and on the same water course, Wynlass Beck, that flows through Millerground. Here is another stand by the side of Wynlass Beck slightly further upstream growing alongside yet another horribly invasive plant, Japanese Knotweed. Pollinators often ignore native plants in favour of this alien invader! 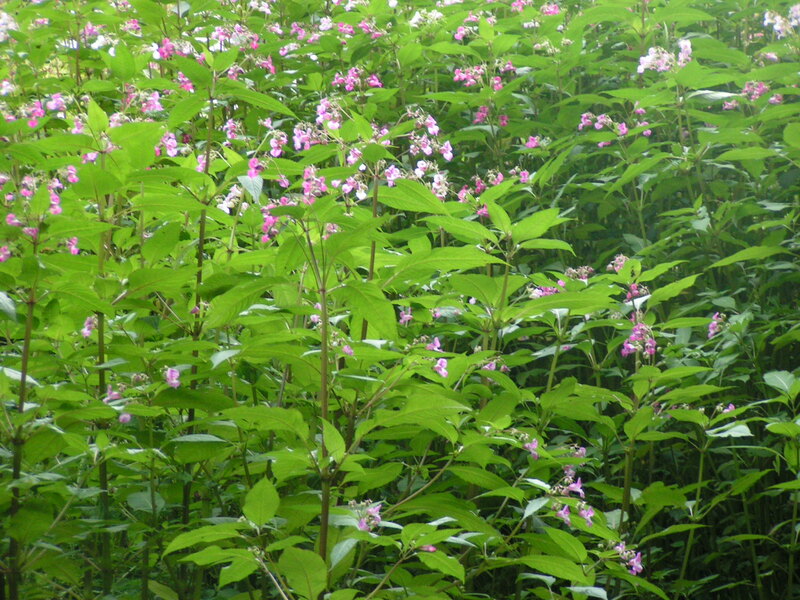 This reduces the seed set of native plants and assists the spread of Himalayan Balsam adversely altering the ecological balance and nature of riparian and wetland habitats. 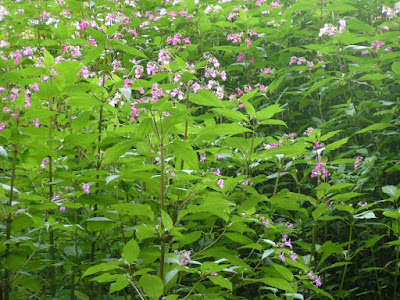 A benefit of eradicating or at least reducing the numbers of Himalayan Balsam will 'encourage' pollinators to actively seek out native plants which in turn will increase in numbers allowing them to make a comeback in areas previously dominated by Himalayan Balsam. This should improve biodiversity...particularly in wetland areas and along river banks. Touch-Me-Not Balsam stand at Millerground last Summer; intensive eradication of Himalayan Balsam in this area has allowed the native balsam to flourish here. A close up of a Touch-Me-Not flower. ...and this to occur year after year. 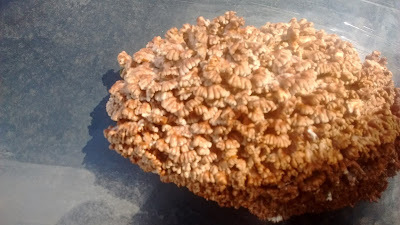 This post has no title...just words and piccys. Today, Friday 8th April, the Trust tenant farmer at Causeway Farm brought three ewes with their day old lambs to the parkland at St. Catherine's. A well earned rest after a bout of heavy drinking! St. Catherine's is very popular with dog walkers so,with the arrival of the livestock, these signs were immediately put up by Trust rangers at access points into the parkland. With livestock back in the parkland, a priority job was to clear the gravel (that had been washed down in the Winter floods) out of the cattle-grid. ....so the Spring Clean had to be done the hard way. The gravel was put to use resurfacing a boggy section of the nearby footpath. Recycling at its best! ...to give a much better surface to this popular footpath. After well over two hours of hard work, and with a fair amount of empathy from passers-by, the job is done! The daffodils in the parkland...a particularly fine display this Spring.